Shelves look great! Seems to be good quality. My only complaint is my bottom board was a little warped. Didn’t make the shelf uneven. The wall anchors seemed of poor quality, so I just bought my own. 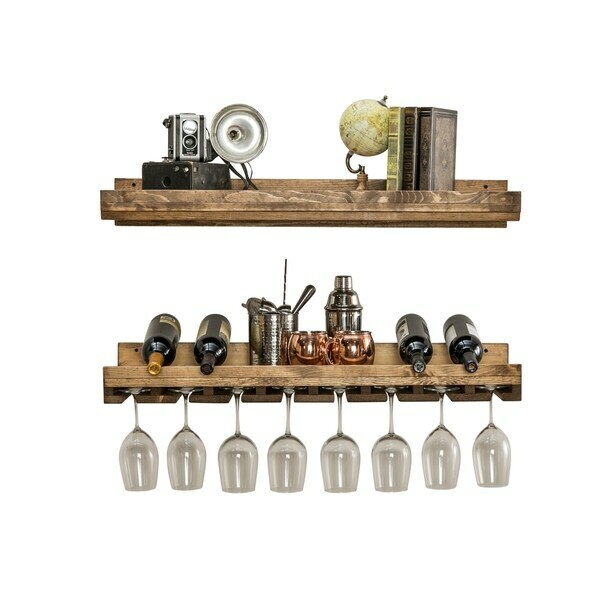 Spruce up your kitchen or dining area with this tiered wine set. With ample storage for wine and stemware, the luxe set provides ideal space for displaying photos, decor and more. The wood's individual marks and characteristics make each piece unique with rustic charm. Dimensions 10.0 In. X 36.0 In. X 6.0 In. I haven’t put these up yet because our basement isn’t done. We plan to put them up in our wet bar area with a brick wall behind it. I love them so far. I can’t wait for the end result. They appear to be a good quality wood. The only Problem I did have is a piece of wood on the end was bent inward. My husband thinks he can fix it. Make sure to look at all the pieces before hanging it.